Smart speaker is getting more and more popular. And Google Home may be the one you choose. If you also subscribed Apple Music, you may want to play Apple Music songs on Google Home. There are two easy ways to get this done. 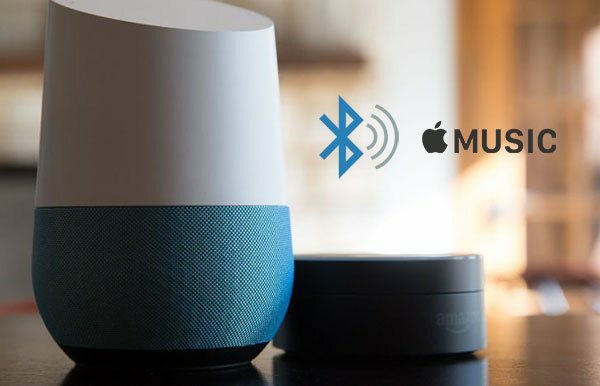 You can directly play Apple Music songs on Google Home using Bluebooth connection, or you can convert Apple Music to MP3, upload the MP3 songs to Google Play Music and use Google Home to play the MP3 files. Please note that you need Apple Music Converter to convert Apple Music songs to MP3. Once your Google Home has been successfully set up, you can use it to play any songs on your mobile, tablet or computer on Google Home via Bluetooth connection. The songs could be iTunes Music, Spotify, Apple Music, Audible and other music files or playlists. Below are the steps to play Apple Music on Google Home via Bluetooth. You can either use Google Home app or mobile Bluetooth settings to pair your mobile device with Google Home. From Google Home app: Open the Google Home app, tap Devices in the top right corner of the app Home screen, find the device card for the Google Home you want to pair with Bluetooth, tap the device card menu and tap Settings > Paired Bluetooth devices > Enable Pairing Mode. From mobile device's Bluetooth settings: Tap Settings on your mobile device's Home screen, turn on Bluetooth and tap the name of the Google Home you'd like to pair. Open Bluetooth settings on your mobile device, under “Available devices,” tap the Google Home you paired to your mobile device. Or you can say "OK Google" or "Hey Google", then say "Connect to Bluetooth". Now tap Music app on iPhone, iPod or iPod Touch, or tap Apple Music app on Android mobile or tablet to start playing Apple Music songs on Google Home. You may need to download Apple Music songs first for offline listening. Above is the first way to play Apple Music songs on Google Home. And the second way is to convert Apple Music songs to MP3, upload MP3 to Google Play Music and play the MP3 files on Google Home. Google Play Music allows you to upload 50,000 songs without paying, so you can convet your favorite Apple Music songs to MP3 and upload them to Google Play Music as a backup and also play the uploaded MP3 songs on Google Home. Apple Music songs are DRM protected M4P files and can't be uploaded to Google Play Music. As to Google Play Music supported audio formats, only MP3 format can be directly uploaded without conversion. 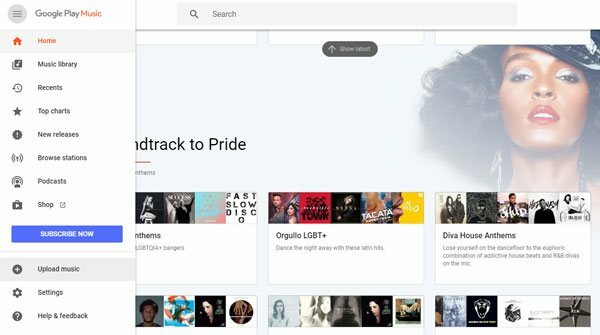 Other formats like M4A, Ogg, FLAC will be converted to MP3 by Google Cloud first. To Convert Apple Music to MP3, a professional Apple Music DRM removal tool is necessary. And TuneMobie Apple Music Converter is definitely the best one. 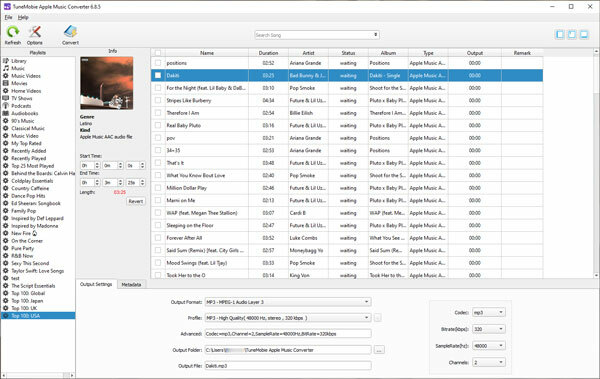 TuneMobie Apple Music Converter can losslessly convert any Apple Music songs downloaded in iTunes library to 320kbps MP3 with song title, album, artist, genre, track number, artwork and other metadata information retained. Besides, you can use ID3 tags and special characters like space, hyphen, slash, etc. 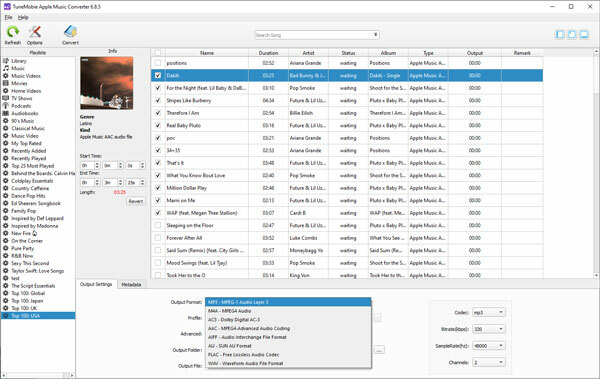 to sort and rename output MP3 files in bulk easily without manual action. TuneMobie Apple Music Converter performs at 16X faster conversion speed and fully support latest Windows 10 and macOS Mojave. If you are using Windows, you can even convert the Apple Music songs you have added to iTunes library but haven't downloaded yet. 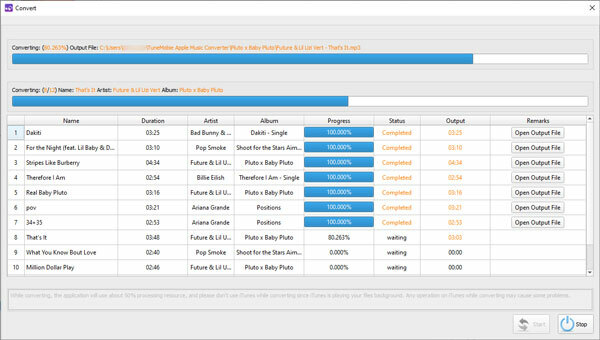 Launch Apple Music Converter on Windows or Mac, iTunes will be automatically launched as well. iTunes library will be loaded and displayed as playlists in the left panel. Apple Music songs will be in Music playlist or saved Apple Music playlists. Click a playlist and select Apple Music songs by ticking the checkbox. You can choose entire playlist by ticking the top checkbox. A built-in search box can also help you search your favorite songs from your iTunes library quickly. Apple Music Converter comes with 7 output formats and MP3 is the default one. Choose MP3 and select high quality in profile list so that 320kbps MP3 can keep 100% original audio quality of 256kbps Apple Music songs. If necessary, click Options to set a filename rule for output files or adjust conversion speed. Now open Google Play Music page, click three-line ≡ button and click "Upload Music" to upload the MP3 files converted from Apple Music songs. You can upload up to 50,000 songs which should be enough for most music lovers. Uploaded MP3 files can be directly played by Google Home without subscribing Google Play Music Premium. Just plug in your Google Home device and set up the device, sign in your Google Play Music premium account which is linked to your Google Home, and say "Ok Google" or "Hey Google", then say "Play <song/album/artist/playlist> from my library". If necessary, you can visit Google's official help about "How to set up your Google Home device", and you can also see the tutorial of "Listen to music on Google Home" to learn more commands and details. Playing Apple Music songs on Google Home using Bluetooth seems to be easier, but the songs will disappear if you cancle Apple Music subscription. Playing MP3 songs converted from Apple Music and uploaded to Google Play Music seems to more complicated, but you can permanently keep 50,000 songs as a backup, save 400GB - 500GB disk space and enjoy them on more devices. Do you want to play your favorite Apple Music songs on Google Home device? Do not hesitate to try Apple Music Converter.